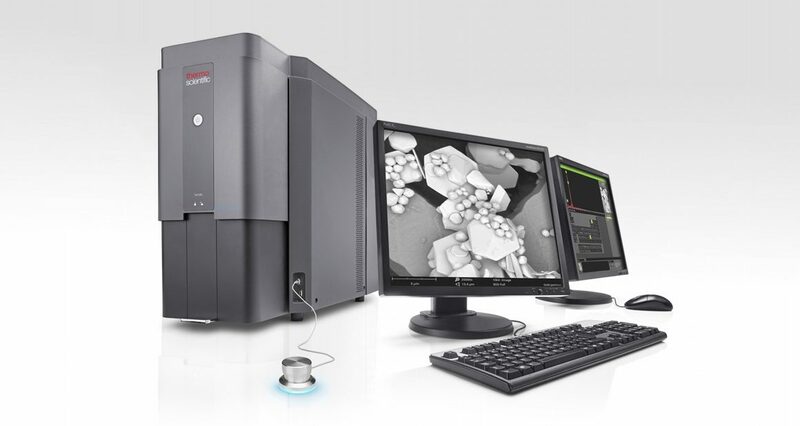 Key components are required for a scanning electron microscope to operate. Electrons are produced at the source by thermionic heating. These electrons are then accelerated to a voltage between 1-40 kV and condensed into a narrow beam which is used for imaging and analysis. 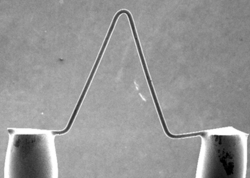 This consists of an inverted V-shaped wire of tungsten, about 100 µm long, which is heated resistively to produce electrons. This is the most basic type of electron source. This is a thermionic emission gun. It is the most common high-brightness source. This solid-state crystal source offers about 5-10 times the brightness and a much longer lifetime than tungsten. This is a wire of tungsten with a very sharp tip, less than 100 nm, that uses field electron emission to produce the electron beam. The small tip radius improves emission and focusing ability. 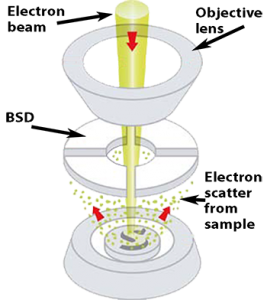 A series of condenser lenses focus the electron beam as it moves from the source down the column. The narrower the beam the smaller the spot it will have when contacting the surface, thus the term ‘spot size’. After the beam is focused, scanning coils are used to deflect the beam in the X and Y axes so that it scans in a raster fashion over the surface of the sample. Samples are mounted and placed into a chamber that is evacuated. The sample chamber can include a translation stage, tilt and rotation devices, feed-throughs to the outside, temperature stages, optical cameras, and a variety of other devices to assist in imaging the sample. When the electron beam interacts with a sample in a scanning electron microscope (SEM), multiple events happen. In general, different detectors are needed to distinguish secondary electrons, backscattered electrons, or characteristic x-rays. Depending upon the accelerating voltage and sample density, the signals come from different penetration depths. 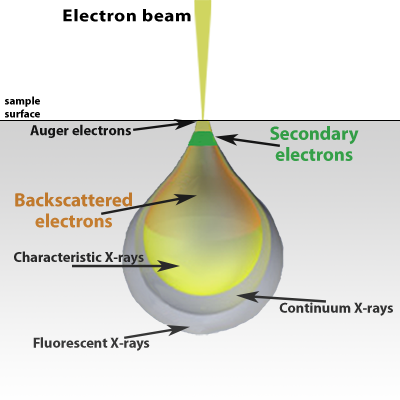 After Auger electrons, the secondary electrons come from the next most shallow penetration depth. A secondary electron detector, or SED, is used to produce a topographic SEM image. SED images have high resolution that are independent of the material and is acquired from inelastically scattered electrons close to the surface. No material composition information is available. 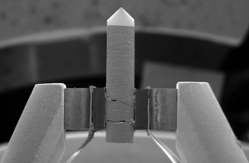 An integrated SED is available for the Phenom SEM for large samples. A backscattered electron detector (BSD) detects elastically scattered electrons. These electrons are higher in energy from atoms below the sample surface. Using a BSD allows for lower vacuum levels, reducing sample preparation requirements and minimizing beam damage. Schematic of a backscattered electron detector (BSD) for scanning electron microscopy (SEM). 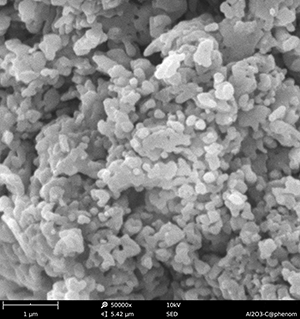 In scanning electron microscopy (SEM), samples are imaged using a focused electron beam that is rastered across a surface. Different types of electrons are emitted from samples. A backscatter electron detector (BSD) detects elastically scattered electrons. These electrons are higher in energy from atoms below the sample surface. Using a BSD allows for lower vacuum levels, reducing sample preparation requirements and minimizing beam damage. Backscattered electrons vary in their amount and direction due to the composition and topography of the specimen. The contrast of the backscattered electron image depends on multiple factors, including the atomic number (Z) of the sample material, the acceleration voltage of the primary beam and the specimen angle (tilt) with relation to the primary beam. Materials with elements composed of a higher atomic number (Z) yield more backscattered electrons than lower Z elements. For the Phenom SEM, a four-quadrant solid-state backscatter electron detector provides both topography and materials contrast (composition) imaging. 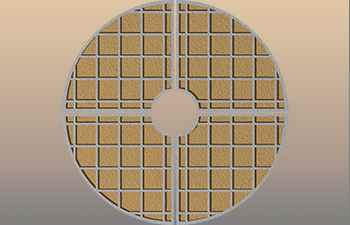 By pairing the detector quadrants and adding the signals, the Phenom SEM displays material contrast using the composition (full) mode. 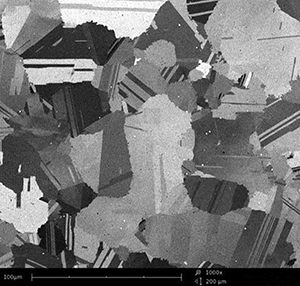 Heavier elements are brighter in BSD images as shown here for a nickel-based superalloy imaged at 1000x magnification using Full mode for material contrast. BSD SEM image at 1000x magnification of a nickel-based superalloy. Operating the BSD quadrants in pairs and then subtracting the information yields topographic images with the Phenom SEM. Compositional and topographic images can be acquired in the same location to provide insight to correlate material properties to topography, grain size or morphology. In scanning electron microscopy, an x-ray is emitted when the electron beam displaces an inner shell electron that is replaced by an outer shell electron. Because each element has a unique energy difference between outer and inner electron shells, the x-rays that are detected yield an elemental identification. EDS data can be obtained at a point, along with a line or mapped over an area. Sample structures can be physically examined and their elemental composition determined. Viewing three-dimensional images of microscopic structures only solves half the problem when analyzing samples. It is often necessary to collect more than imaging data to be able to identify the different elements in a specimen. 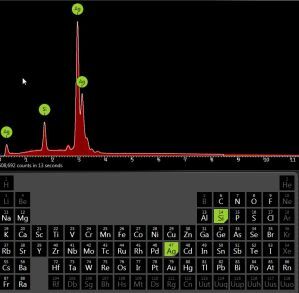 Using EDS with SEM addresses this need for elemental analysis. A secondary electron detector (SED) for scanning electron microscopy offers images with resolution independent of the material. An SED image uses the inelastically-scattered electrons close to the sample surface for topographical information.